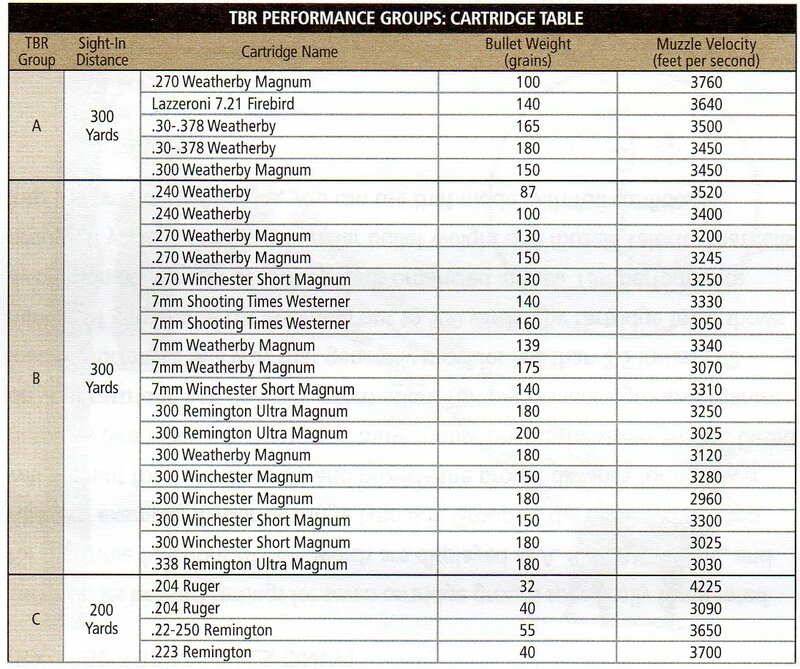 This part of the review covers the Functions and Menu features along with the optical quality of the Leupold RX-1000 TBR Rangefinder. 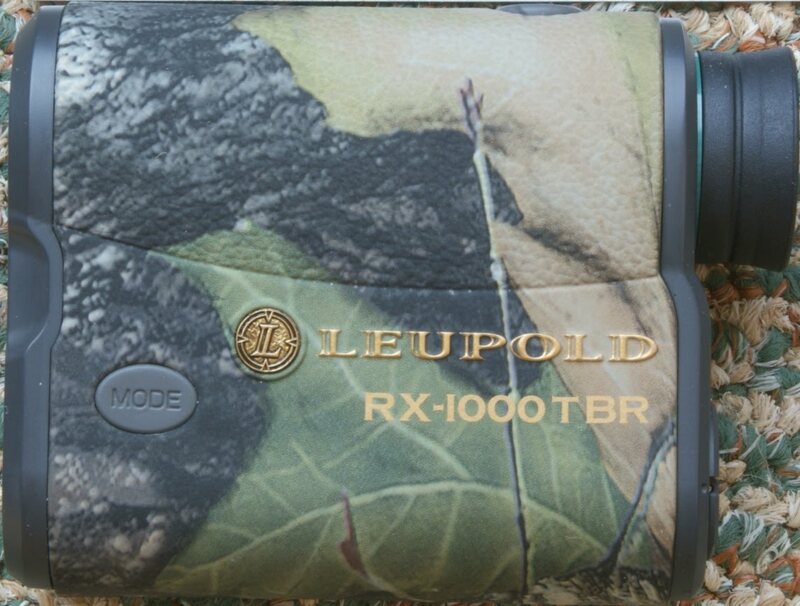 If you missed reading Part 1 of the review you can find it at this link Leupold RX-1000 TBR Rangefinder Review - Part 1. Part 1 covers the geometry of the rangefinder. The below in italics lists some of the features that Leupold states about this rangefinder and I will try to cover these features in this portion of the review. The two buttons required to control the rangefinder are on the top (Power) and left side (Mode) as shown below. When you first press the Power button, the rangefinder will show a display similar to this photo below. The reason I say similar is that the rangefinder is displaying the configuration that I have already setup for my use. In this view, I have mine setup to show the True Ballistic Range (TBR) based on the Ballistics Aiming System (bAS) distance for the TBR Group AC. This group is for my .308 rifle. I will explain more thoroughly later in the review. The units will be displayed in yards (YD) and the rangefinder will also display the Line of Sight (LOS) distance along with the angle from horizontal. The battery life indicator is always displayed when the unit is turned on. Keep in mind that everything I'm going to show with regard to the Functions and Menus can be found in the Leupold's owners manual. Hopefully my efforts will make it a little easier to read and provide further clarification. Also, if you click on a photo, it will bring up a higher resolution photo. It was extremely difficult to get good photos looking through the rangefinder. If the image is not clear in some of the photos, that is my fault, not the rangefinder. Pressing the Power button a second time will cause the rangefinder to measure the range. In the photo below, the trees are 37 yards from my deck and because I was only at a 1 degree angle, the True Ballistics Range (TBR) and the Line of Site (LOS) range are the same. To give you an idea of the clarity, the photo below of the tree trunk is approximately 37 yards away. 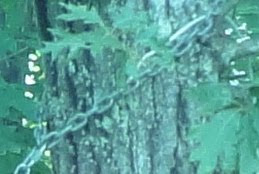 Notice the chain wrapped around the tree. The second photo is zoomed in on that chain. The detail you are able to see is unbelievable. Also it is hard to appreciate, but I'm taking this photo with a Sony point-and-shoot camera while holding it up to the eyepiece of the rangefinder. Another example of the image quality is shown below. I am very impressed with the brightness and clarity of the optics in this rangefinder. In this photo, the house is 133 yards away. Once the power button is pressed, the unit is turned on and you can access the menus by pressing the Menu button and holding it for about 1 second. The first Menu item is the True Ballistics Range (TBR). Once in this mode, pressing the Power button will toggle between on or OFF. HOLd (Hold) - Displays the appropriate hold over or under amount based on your ballistic group and sight-in distance. When set, the upper display will flash "HI" or "LO" and then the hold amount in inches or centimeters based on the units you select. MOA (Minute-of-Angle) - Displays the minute-of-angle adjustments based on your ballistic group and sight-in distance. When set, the upper display will flash "UP" or "dN" and then the MOA adjustment. bAS (BAS or Ballistic Aiming System)- The upper display will show the equivalent horizontal range based on your ballistic group and sight-in distance. 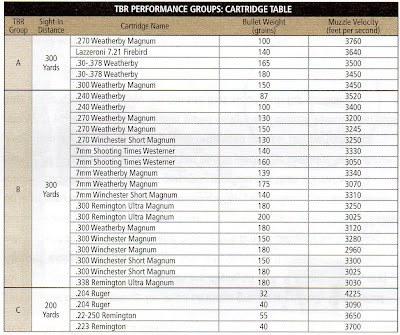 The rangefinder has seven rifle ballistic groups. 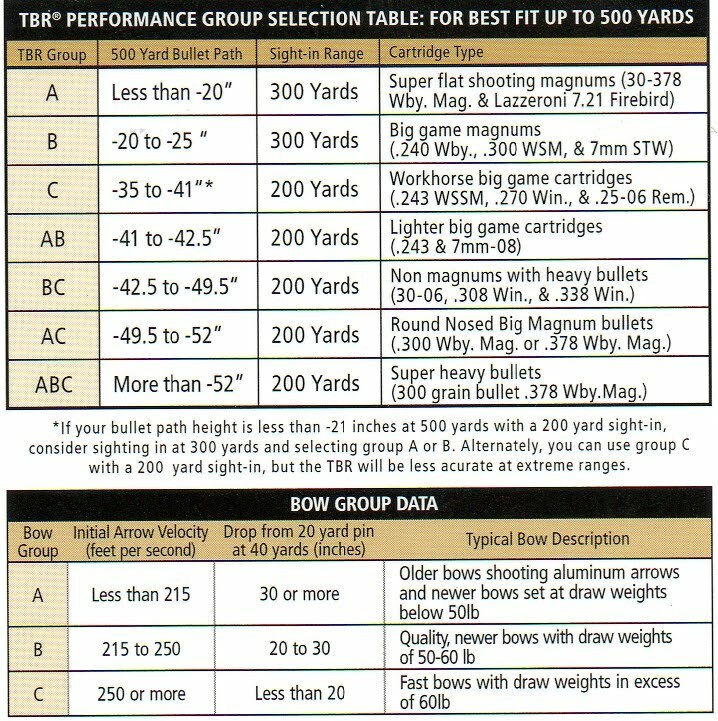 Leupold has selected these groups generally to keep the error down to less than 2.5" of bullet impact out to 500 yards. 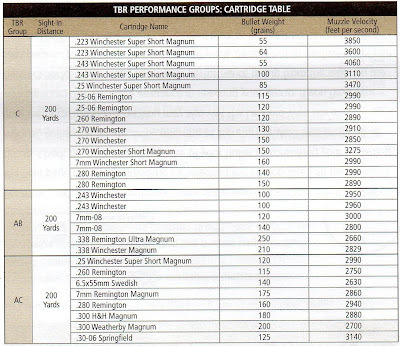 The tables below show the cartridges identified for each group. 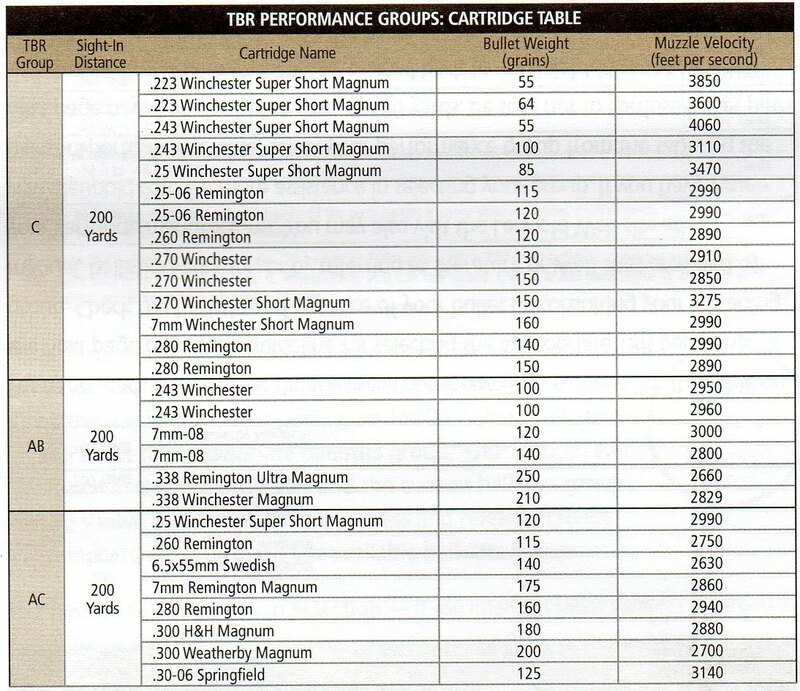 If you have a cartridge that is similar to the ballistic data of one of these, you should choose that group. 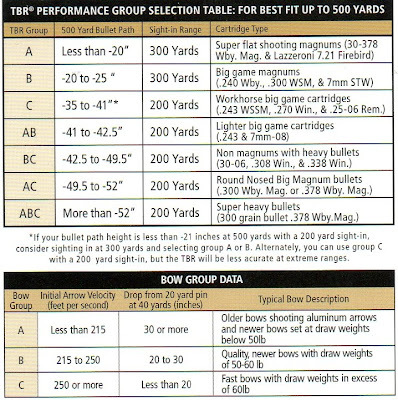 Leupold's quick reference card looks at this same basic data but in terms of bullet drop. Once you are in the Group (GrP) mode, you can toggle to the correct bullet group for your cartridge. The next mode is the Bow mode. When in the Bow mode, it automatically deactivates the rifle mode and you must select a Bow Group that corresponds to your bow. The Bow Group Data is shown above. Press the Power button to toggle between Bow on or OFF. Once the Bow mode is on, you can press the Mode button again and it brings up the Group (GrP) screen. Pressing the Power button toggles between the three possible Bow groups. Below you can see I have selected group C.
The Display mode is used to adjust the brightness of the display. There are three different brightness levels, Lo, Md & Hi. The power button toggles through these different display brightness levels. There is a second method for adjusting the display brightness. Press and release the Power button to activate the rangefinder, then press and hold Power. While Power is held depressed, press and hold the Mode button for 1 second. After 1 second, release Mode; each subsequent depression of Mode will cycle through the available intensity settings. The rangefinder can display units in yards or meters. When in the Units mode, you can toggle between yards and meters by pressing the power button. This mode is to display the distance to the farthest (Last) object when the unit may be reading more than one object. Leupold says that multiple objects will often return an average distance and this mode ensures an accurate reading to the farthest object. You can toggle between the "on" mode and "OFF" mode by pressing the Power button. This is the straight line distance (Line Of Sight) to the object and is displayed in the lower portion of the display. You can toggle between the "on" and "OFF" mode by pressing the Power button. If you turn off the rifle and bow mode, LOS will turn back on automatically. You have three choices for the reticles. My preference has been the Plus Point only. It is very visible and covers the minimum amount of your viewing area. To summarize this part of the review, I feel that this rangefinder has true optical quality. Every time I use it, I find myself impressed with the brightness and clarity of the image. Also I feel that the functions and menus seem manageable. If I were to say one thing negative, it would be how they jump from upper to lower case letters and until you get the hang of this, it may be a little confusing. 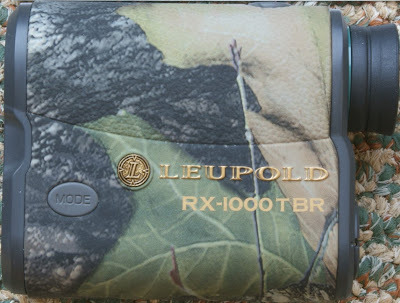 This concludes Part 2 of the Leupold RX-1000 TBR Rangefinder Review. I will be working on Part 3 of the review in the near future. Part 3 will cover the accuracy of the rangefinder along with some dialog on the methods used for their bullet/arrow drop compensation. A great review. Thanks for putting in the time. I just lost mine in the mountains, but intend to get another. I liked ALL the features except the difficulty to see the red in bright sunlight and then it is too bright at dark. An adjustment but sometimes you don't have time for that! This review was very helpful and easy to follow. I am very familiar with the functions of this great range finder now and have it set to my desire. Thanks for providing this to fellow hunters. Much appreciated. Great review! This helped me make the decision to purchase! Bow hunt mainly, so was looking for information on how the bow mode functioned. Was looking for something different than the Bushnell Scout 1000 with ARC that I've hunted with for a few years now but is hard to see in low light. Thanks again for putting in the effort!